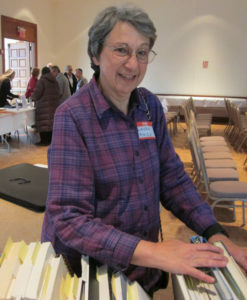 The Society maintains an extensive research library of books and maps at Temple Emanuel in Newton that is available for use during JGSGB programs held at Temple Emanuel. See schedule of programs. 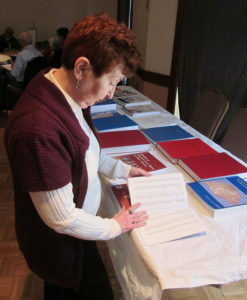 The Society also has a small collection of basic reference books at the Jewish Heritage Center, located at the New England Historic Genealogical Society (NEHGS) at 99-101 Newbury Street, 5th floor, in Boston, where advance appointments are recommended. Contact the staff at reference @ ajhsboston.org or 617-226-1245. The reference books and maps cannot be borrowed at either location, though many of the titles are also available at local academic and public libraries. Here is the current listing of materials in the two research collections maintained by the Society. The books labeled (TE) are at Temple Emanuel in Newton and those labeled (JHC) are at the Jewish Heritage Center in Boston. In addition to the JGSGB map collection, there is an extensive digitized map library on the FEEFHS (Foundation for East European Family History Studies) website.